While part of the St. Louis Box Turtle Project, Georgette survived a serious bacterial infection and an animal attack. She died during the polar vortex at approximately age 15. For those who knew her, Georgette was a feisty drifter who lived and died in Forest Park. She was also somewhat of a local celebrity. The three-toed box turtle was one of the oldest subjects in the St. Louis Box Turtle Project, a study designed to understand the health and movement of urban turtles. Even among her armored prehistoric kin, Georgette was particularly tenacious. In 2014, she survived a serious bacterial infection, and a few months later, lost her front leg in an animal attack. But the intense cold during last week’s polar vortex proved too much for her — and she died. Jamie Palmer, a technician with the St. Louis Zoo’s Institute for Conservation Medicine, can pinpoint the day she first met Georgette: May 2, 2013. Jamie Palmer tracks box turtles in Forest Park using a radio receiver. “When we first found her, she kept trying to bite us,” Palmer said. “Then she peed all over us. We were like, ‘Gosh, she’s so mean!’” Palmer decided to name her after a spunky poodle from "Oliver & Company," a Disney movie she had been watching on repeat with her three-year-old son. They glued a tiny tracking device to the back of her shell. Inside, a special tag emits a unique radio pulse which allows them to track her movements through the forest with a receiver. They also collected a small blood sample from Georgette and each of the other box turtles, to better understand whether urban turtles had more stress hormones in their blood than their country cousins. After a year of observing Georgette, the team learned just how tough she really was. In June 2014, Georgette got sick. It was the turtle equivalent of a head cold, caused by Mycoplasma bacteria. Palmer and her colleagues weren’t allowed to treat Georgette, but they returned to Forest Park every day to check on the little turtle and look for signs that she was recovering. They noticed she was acting strangely — at least by healthy turtle standards. It’s a phenomenon observed in other reptiles — sometimes known as “behavioral fever” — in which lizards and turtles bask in the sun to raise their body temperature and fight infection. Georgette survived an animal attack in late 2014, in which she lost a leg. With only a single front leg, she was no longer able to dig a burrow in which to hibernate during the winter. Sharon Deem, director of the Institute for Conservation Medicine, said Georgette “read the textbook” to fight the infection. Deem co-founded the St. Louis Turtle Tracking Project in 2013, along with her husband and fellow scientist Steven Blake. But just a few months after surviving the infection, a predator attacked Georgette and bit off her front left leg. Box turtles normally dig themselves a shallow burrow in preparation for their winter hibernation. Georgette wasn’t able to dig a burrow with only one front leg, so she wedged herself under a fallen log and some leaves. “Everybody was rooting for Georgette,” said Deem, a wildlife veterinarian and epidemiologist. Georgette survived the winter — and then another. By 2017, hundreds of St. Louis students had helped track the three-legged-turtle on class field trips. 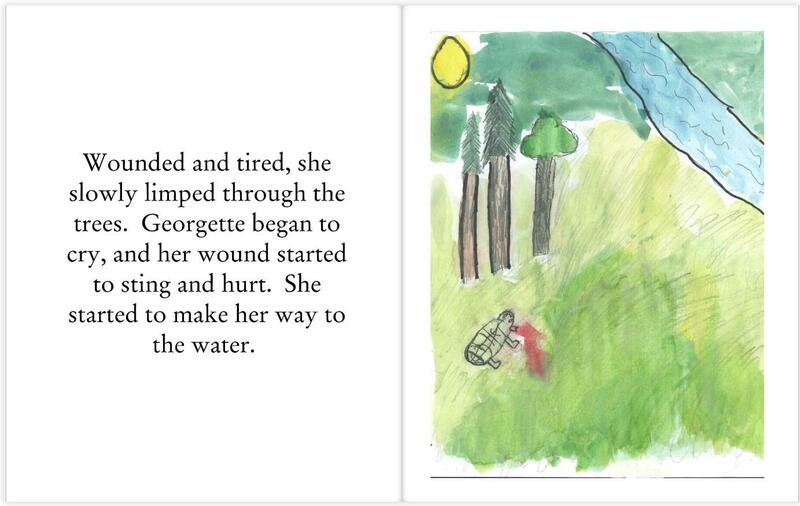 A group of third and fourth graders at the St. Michael School of Clayton wrote and illustrated a book about Georgette. Georgette survived four winters with only one front leg and was halfway through her fifth when the polar vortex swept across the Midwest. Temperatures plummeted into the single digits and, at some point, Georgette the survivor died in a quiet corner of Forest Park’s Kennedy Woods. The Missouri Department of Conservation permitted the project as a wildlife study, but the permit does not allow researchers to treat the turtles or bring them inside. Although it’s difficult to pinpoint her exact age, the research team estimates she was at least 15 years old when she died. Over the past twenty years, she's tracked the movements of a wide range of animals across the world, including elephants and maned wolves. Thanks to Georgette and the other turtles in the project, the research team is now on the path to understanding how these charismatic reptiles move through urban environments and the different types of diseases they’re susceptible to.